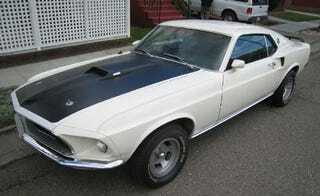 Alameda has quite a few 1960s Mustangs on the street, but our last one was months ago. This '69 always parks on the street (not far from the '60 Studebaker Lark), though it's usually under a car cover. However, it does get regular driving use, as I learned when I talked to the owner (who says he gets offers on the car from other drivers at stoplights). And no wonder- this car is very clean and sounds great. It's not an obsessively restored show car, but about as nice an example as you're going to find living outdoors and driving frequently. Scoops all over the place. It must be fast!